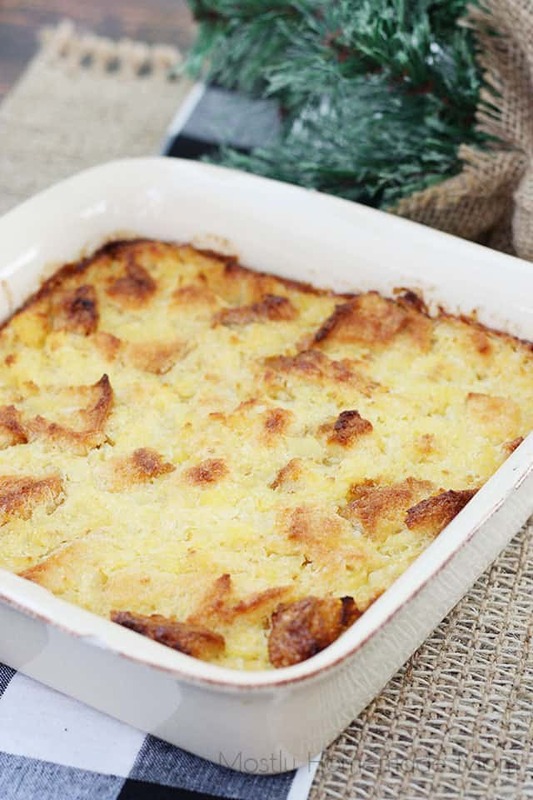 Pineapple Stuffing is the perfect side dish for Thanksgiving or Christmas! 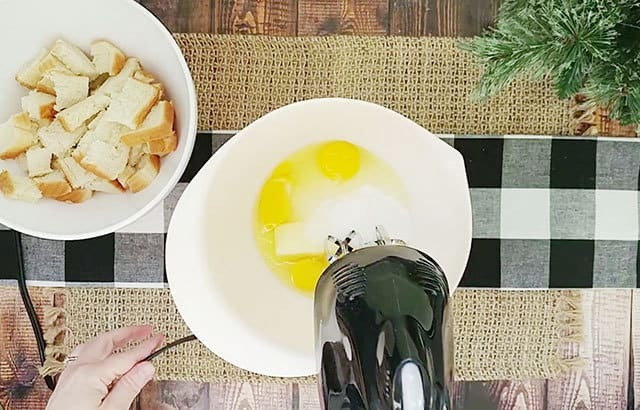 Cubed white bread, sugar, eggs, and crushed pineapple – I cant get enough of this recipe! 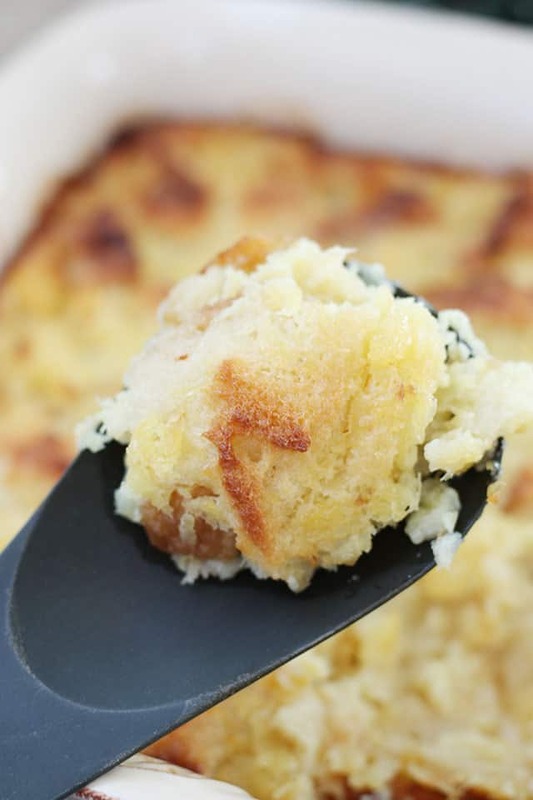 It is not Thanksgiving in our family without this Pineapple Stuffing! We usually make a double batch because of how much our family has grown, but especially because no one in our family can resist this amazing stuffing recipe! A typical Thanksgiving feast isn’t complete without the turkey, sweet potatoes, and stuffing at the bare minimum. 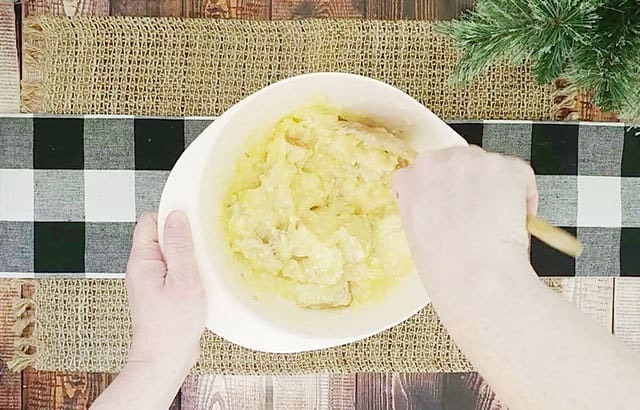 If you’re not sure about swapping our your typical savory dressing, make this pineapple stuffing as well to try it out – I’m certain it will become a regular! What kind of bread do I use? Just plain, white sandwich bread is the best choice for pineapple stuffing. It pairs well with the sweet sugar and pineapple. How do you drain crushed pineapple from the can? Pop the lid of the can and set it on top pressing down and tilting to allow the excess liquid to drain out into the sink. Similar to how you would drain tuna in a can. Crushed pineapple is very wet, so you’re really only draining the excess moisture as much as you can – there will still be some moisture left and that’s ok! In a large mixing bowl, beat together softened butter, sugar, and eggs until creamy. Add cubed white bread and stir until the bread is well coated in the pineapple batter. 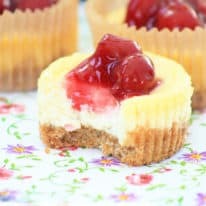 Spread batter into a greased, square baking dish and bake until golden brown. Can pineapple stuffing be made ahead? Absolutely! 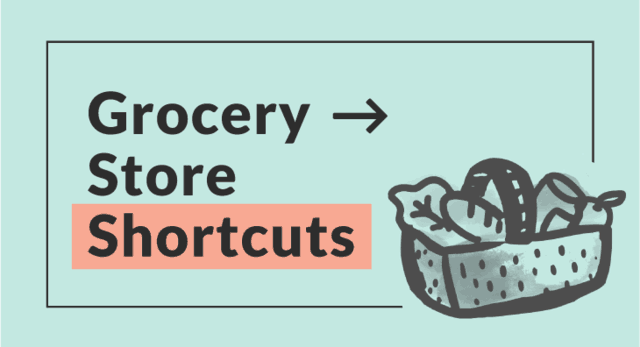 Make it up the night before, cover with foil or plastic wrap, and store in the fridge. Then just pop it in the oven when you’re about an hour away from dinner time! 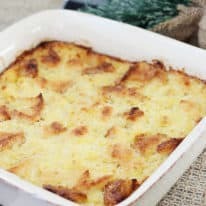 Baked and cooled pineapple stuffing can be frozen – this is a great recipe to make a few batches of and then stick in the freezer for an easy side dish. 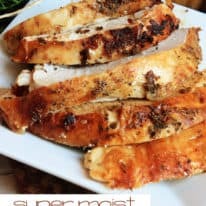 Super Moist Roast Turkey Breast – don’t forget to thaw the turkey in the fridge the week before! 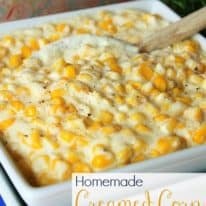 Crockpot Creamed Corn – decadent and mouthwatering! 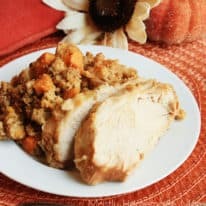 If you liked this recipe for Pineapple Stuffing, please leave a rating and a comment below this post! 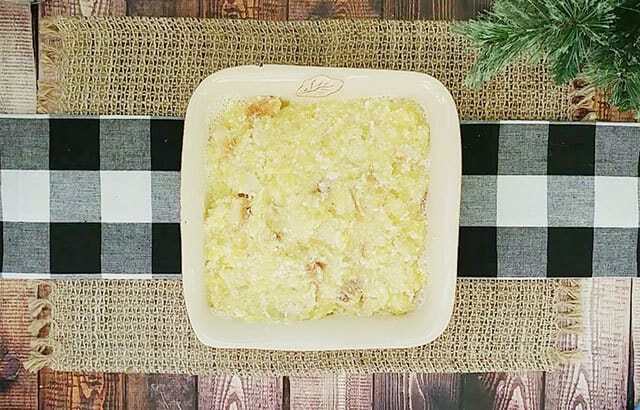 Pineapple stuffing recipe with white bread cubes, sugar, eggs, butter, and crushed pineapple. 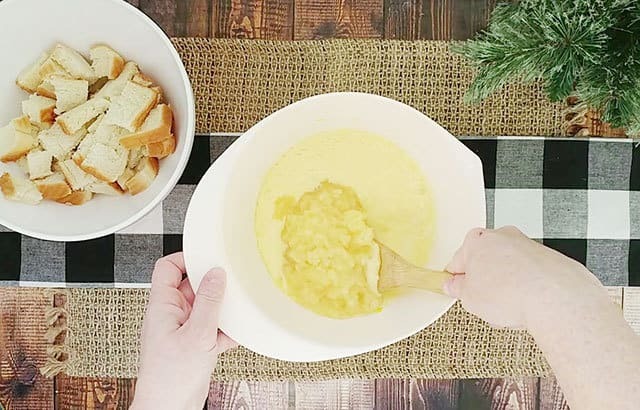 In a mixing bowl, beat together butter, eggs, and sugar until creamy. Stir in the crushed pineapple. Add the bread cubes and stir until well coated. Transfer to a greased square baking dish. Bake at 350 degrees for 1 hour or until golden brown. It's funny, Ellen. 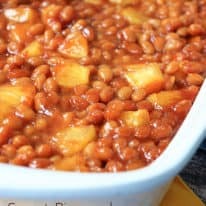 When I made this for the recipe post I served it along with BBQ chicken! It went really well together, too. This is one of my absolute favorite holiday dishes! And to think I didn't experience the glory of Pineapple stuffing until two years ago. Our best friends make this for every holiday and you're so right… it's definitely like dessert and who says no to that on their dinner plate? This sounds a lot like a dish we call Upside Down Pineapple Souffle. 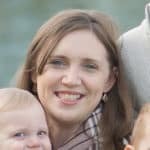 Are you from the Chicago area by any chance? This looks so good and it is making me cave some home cooked meals! 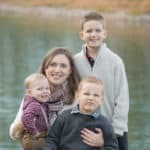 Thank you for linking up at Show Me Your Plaid Monday's! I hope you come back each week! This is definitely a new dish for me. It sort of reminds me of a bread pudding without the custard. It does sound delicious though! Thanks for sharing on Thursdays Treasures. I love pineapple – I think I have a similar recipe in my arsenal, but I've never made it. Thanks for linking up to Tasty Thursday.